If you have any questions about the WHITE RABBIT CHARLIE information page below please contact us. The sailing yacht WHITE RABBIT CHARLIE is a 36 metre 118 (ft) well sized aluminium superyacht which was newly built by Austal and conceived by Austal. The well proportioned catamaran WHITE RABBIT CHARLIE is a particularly high quality Australian built superyacht which was launched to celebration in 2000. Sleeping 12 passengers and 5 crew members, sailing yacht WHITE RABBIT CHARLIE was named White Rabbit. The naval architect responsible for the plans and general arrangement for the yacht is Austal. The interior styling is sucessful creation of Image Marine. She could be described as a modern catamaran. Catamaran WHITE RABBIT CHARLIE was hull number Im 161. She can travel at speeds of up to 21 knots. 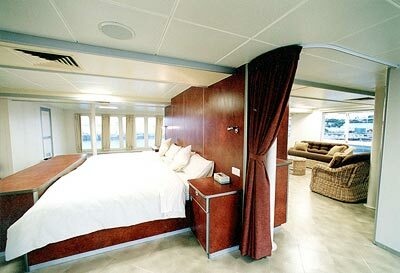 Her cabin configuration consists of an Owners suite, 4 two berth, 1 three berth and a four berth cabins. Austal Inhouse Yacht Design was the naval architect involved in the technical nautical design work for WHITE RABBIT CHARLIE. 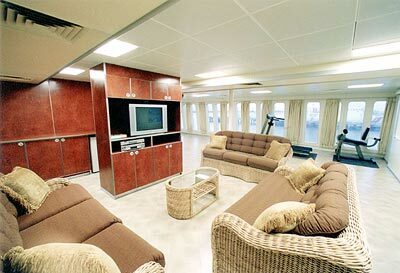 Her interior design was completed by Image Marine. Austal is also associated with the yacht general design work for this yacht. 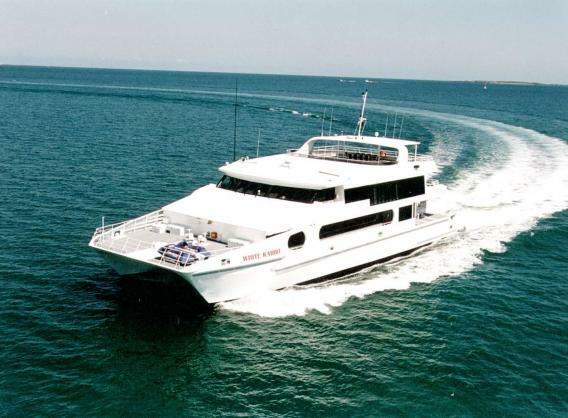 In 2000 she was actually launched with celebration in Henderson Wa and following sea trials and final completion was then passed on to the new owner. Austal completed their new build sailing yacht in Australia. A spacious feeling is achieved with a maximum beam (width) of 12 m or 39.37 feet. With a 1.55m (5.1ft) draught (maximum depth) she is shallow. The material aluminium was used in the building of the hull of the sailing yacht. Her superstructure above deck is created out of aluminium. 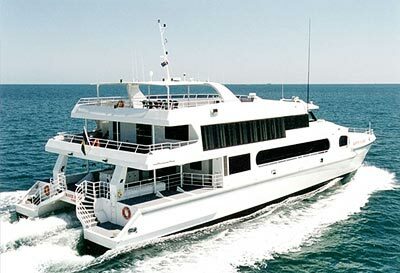 Installed with two MTU diesel main engines, WHITE RABBIT CHARLIE will reach a top speed of 23 knots. Her propulsion units are twin screw propellers. She also has an economical range of 800 nautical miles whilst motoring at her cruise speed of 21 knots. Her total HP is 2760 HP and her total Kilowatts are 2031. As for thrusters she was fitted with Keypower. 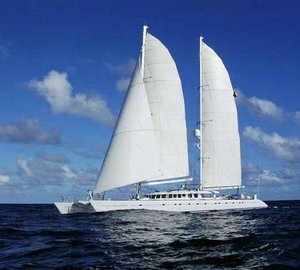 The well sized luxury yacht S/Y WHITE RABBIT CHARLIE can sleep as many as 12 guests in addition to 5 professional crew. 36 metres / 118.1 feet. Main Engine(s) is two 1380 HP / 1015 kW MTU. The Model type is 12V 2000 M90 diesel. Giving the combined power of 2760 HP /2031 KW. Approximate Cruise Speed is 21 knots. 800 at a speed of 20 knots. WHITE RABBIT CHARLIE features a aluminium deck. The luxury yacht WHITE RABBIT CHARLIE displayed on this page is merely informational and she is not necessarily available for yacht charter or for sale, nor is she represented or marketed in anyway by CharterWorld. This web page and the superyacht information contained herein is not contractual. All yacht specifications and informations are displayed in good faith but CharterWorld does not warrant or assume any legal liability or responsibility for the current accuracy, completeness, validity, or usefulness of any superyacht information and/or images displayed. All boat information is subject to change without prior notice and may not be current.